Katy Nugent graduated with her bachelor’s in Environmental Biology from the University of Saskatchewan in 2016 and began working in the Helen Baulch Laboratory a few months prior to convocation. Since then, she has worked as a field technician and research assistant, primarily leading boat-based field operations across multiple student projects, stream monitoring, and wetland operations. She also helps in the development and preliminary trial runs of new protocols for student projects. 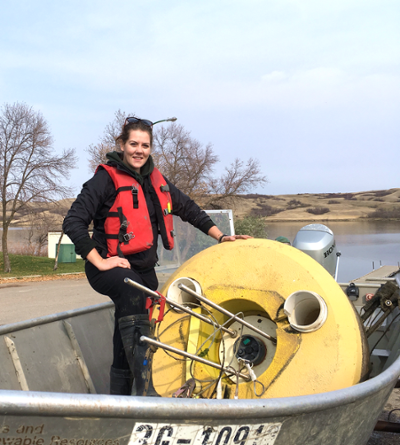 Katy’s favorite project is the water quality monitoring buoys located in several locations in Saskatchewan, she handles the maintenance of sensor-based instrumentation and corresponding water sampling. Her upbeat and positive attitude is always appreciated around the office and ‘I can fix it’ spirit is always an asset to the technical side of research.